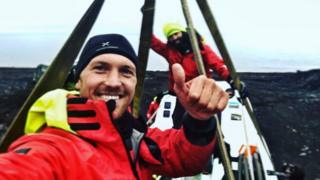 Image caption Alex Gregory says he was "happy to be alive and on dry land"
A group of British rowers say they are "extremely happy and healthy" despite being stuck on a remote Norwegian island for more than a week. The men, including Olympic gold medallist Alex Gregory, say they do not expect to be rescued for at least another week. The group sought refuge on Jan Mayen on 19 August, a month after starting their expedition from Norway to Iceland. Despite not completing the row, they say they achieved 11 world records. On 20 July, the group of nine, which included men from Iceland, India, the United States and Norway, set out from Tromso, Norway. They headed north towards Svalbard, a group of islands which lie midway between the mainland and the North Pole. In nine days the crew completed the 521 nautical miles (965 km) and achieved eight world records. They spent two nights in Svalbard making changes to the crew and preparing for the second leg of the row to Iceland. On 7 August, the group began the next part of their expedition, and three days later they reached the Arctic sea ice, becoming the first recorded rowing boat to reach such a northerly latitude. But soon after, the weather became overcast, and after five days of no visible sun the boat's solar-powered batteries had drained. Eight days after leaving Svalbard, the power had stopped all electrical equipment from working. The crew had to resort to manual steering and without navigational aids decided to head towards the island of Jan Mayen - 370 miles (600 km) from Iceland. In a post on 18 August, while still at sea, the group said they had had a "phenomenally tough 72 hours". "I've never been so wet and cold. It's seeping into my bones, there is absolutely no escape from it. Two degrees, 99% humidity [so] nothing will dry," said Gregory. "I have to wait for land. "It's getting worse though, the colder I get, the more I have to work during my shift, the sweatier I get, the wetter I get, the colder I get." A day later they reached the island. Its only inhabits are Norwegian Armed Forces personnel, and a small number of people working for the Norwegian Meteorological Institute. Due to ill health, four members of the crew then decided they would not continue to Iceland. The group had experienced several "difficult and dangerous" days, with some struggling to keep food down. Another crew member, Danny Longman, said even though the decision to change course was the correct one it was "framed with disappointment". But he said he did feel relieved to reach dry land. The Polar Row team is currently being looked after by the Norwegian military while they await rescue but say they are "all extremely happy, healthy and enjoying our [their] time here on Jan Mayen". After days at sea in the cold and wet, they said they "couldn't be warmer" on the island. Being supported by the military, the crew said they were "keen to do our [their] bit" and not disturb the workings of the island. One morning the men took over the cleaning duties, adding "this is a busy working place, we want to be helpful while we are here!" Mr Gregory said Skipper Fiann Paul was "still pursuing options" to bring new crew members to the island to complete the expedition. Asked when they will be able to return home, he said a boat visiting the island next week "may be the best opportunity". Despite missing their families, the crew said they are not going without anything on Jan Mayen except perhaps running short on clothes. Mr Gregory said he was looking forward to telling his children about the whales, waves, ice and birds he had seen.